The Dungeon Sweeper (Carcer analecta) is a boss-monster. 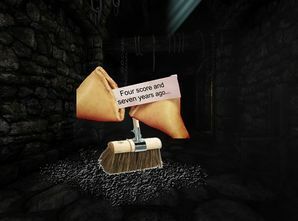 The Dungeon Sweeper: Friend, Foe, Food, Family, Fortune Cookie, Four Score and Several Years ago? Actually all of the above define the Dungeon Sweeper. It has proven time and time again to be both feared and revered for its actions. It is a friend because it sweeps all the dungeons and keeps them remarkably clean. It is a foe because if you step in an area it has already cleaned, you will regret it in your afterlife. It is food because after you kill it, it is believed that it tastes excellent. But seeing as no one has successfully killed it, the true taste is unknown. It is family because it secretly is dating your sister, and will soon propose to her. She likes how clean it is. It is not actually a fortune cookie, that was fabricated by evil doers. It is also the Gettysburg Address, because it is well known that Abraham Lincoln wrote his famous speech on the back of a Dungeon Sweeper, proving once again that Abraham Lincoln is pretty much the most badass president. This page was last edited on 22 January 2019, at 01:55.